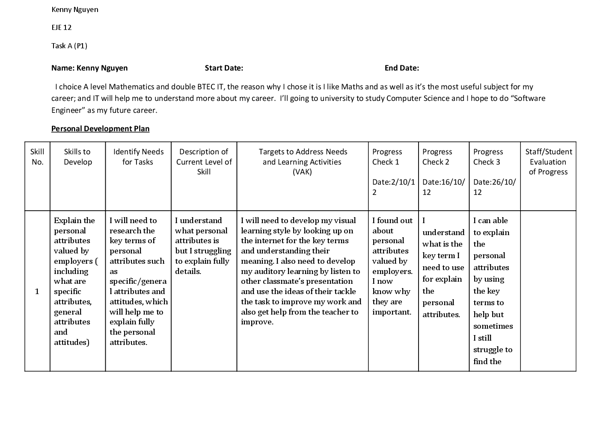 ﻿Kenny Nguyen EJE 12 Task A (P1) Name: Kenny Nguyen Start Date: End Date: I choice A level Mathematics and double BTEC IT, the reason why I chose it is I like Maths and as well as it?s the most useful subject for my career; and IT will help me to understand more about my career. I?ll going to university to study Computer Science and I hope to do ?Software Engineer? as my future career. Personal Development Plan Skill No. Skills to Develop Identify Needs for Tasks Description of Current Level of Skill Targets to Address Needs and Learning Activities (VAK) Progress Check 1 Date:2/10/12 Progress Check 2 Date:16/10/12 Progress Check 3 Date:26/10/12 Staff/Student Evaluation of Progress 1 Explain the personal attributes valued by employers ( including what are specific attributes, general attributes and attitudes) I will need to research the key terms of personal attributes such as specific/general attributes and attitudes, which will help me to explain fully the personal attributes. I understand what personal attributes is but I struggling to explain fully details. I will need to develop my visual learning style by looking up on the internet for the key terms and understanding their meaning. I also need to develop my auditory learning by listen to other classmate?s presentation and use the ideas of their tackle the task to improve my work and also get help from the teacher to improve. ...read more. I understand what I need to do to help me access and get resources file from FROG. I can able access to frog by listen to the teacher instructor but I still don?t know how to get resources file. I can fully able to access to FROG and get the support resources by watch my friends do it and do it in my own. 5 Follow PDP I will need to follow the task on my assignment booklet; this will help me keep on track during the task. However I need to read the PDP properly so I can fully understand what I need to do. 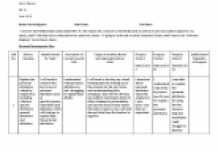 I can understand the PDP by reading through it However I need to take notes for the key points of PDP so I can easily see the main keys of the task which is help me to complete it. I will need to improve my visionary learning by reading the PDP slowly and taking notes for some important parts. However, I also need to further develop my auditory learning skill by listen to teacher introducing. I found out how important it is to follow the PDP. I can able follow my PDP but sometimes I still forgot to write the process check. ...read more. I understand what I need to do to help me access to FROG. I can able access to frog by listen to the teacher instructor but I still don?t know how to save my work. I can fully able to access to FROG and save my work by try it out by my self. 10 Review a draft documents to produce final versions I need to select the main key point of draft documents and rewrite it to produce the final versions. I understand the documents and I can point out the main key points but I still struggle with producing the final versions from the draft documents. I need to further develop my kinaesthetic learning by practicing the writing skill. As well as improving my visionary learning by selecting the main key points to help and also need to read carefully the teacher notes to help me produce the final versions. I understand what I need to do to produce the final version of my work. I can able to proofread my work better than draft work but I still not sure if is it correct or not. I can produce the final version from the draft version but sometimes I still struggle with how to changes the sentences to make it better. ...read more. Decisions can be made quickly unlike in a hierarchical when they will have to discuss what to do. Staffs are more independent. Also the company can save money. Weaknesses of a Flat structure Wide span of control can be difficult because one person may not be able to get round to everybody. Background style The web pages where all created in Adobe Dreamweaver CS3. The background was created by clicking on page properties and on the background image select the image index_04.jpg. This is shown below. I then inserted a table on top of the background that is three columns by four columns. Personal Determination This attribute is particularly valuable to employers whereby the employee will stop at nothing to get a job done or find a solution. For example, the 3 sales persons who work for IT services will have to persist with customers and capture a deal. I have included controls beneath each video for the user to select a section of the song they wish to practise. There is a Play/Pause button as well as Rewind and Fast Forward. I have also included animation as mentioned above as well as images and video which can be seen in my implementation. Planning - by planning ahead this will help those to achieve their goals within the time limits given. This does not necessarily have to be a written plan, however but by thinking about the tasks being performed will help to increase a measure of success in the tasks set out to do. able to delete information * Data should be able to be accessed again once saved by user * The system should be able to provide the user with accurate stock levels. * Invoice should be printed on a sheet of A4 paper after details have been submitted. This is the highest level offence; this offence can carry fines up to £5000 and imprisonment of at a maximum of 10 years. An example could now be that the student later gains access to the computer and data and figures out a way to get past the school firewall and starts to alter his grades and steal student’s data.